toward their next destination—wherever that may be! Welcome! We are Brittany and Ehren: motorcycle enthusiasts, novice paragliders, and travel partners 9 years on. Roaming the world in search of new experiences—people, cultures, sights, sounds, and landscapes—we want to explore and share with others this amazing world around us. One of our goals with this change of lifestyle is to get back to what’s important to us – experiencing new places together, attempting to satisfy that ever-present curiosity about our little blue speck in the universe. It’s how we met in the first place (read about that here), and it’s what continues to bring us together. Also, we are at a perfect point in our lives to make the most of traveling the world our way (as waiting until retirement is not always a certainty). Debt-free, no kids and recently married after nine years together, we’ve never been more ready for this journey. 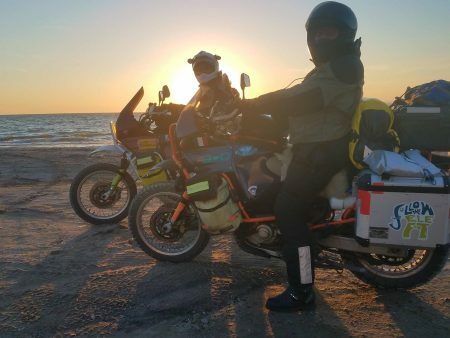 Riding around the world as fast or as slow as it takes, we aim to discover what we can with our short time on this earth. We have no idea where this journey will take us, nor would we want to. 'Follow the Elefant' makes sense to us in a number of ways. Find out how the name came to be.